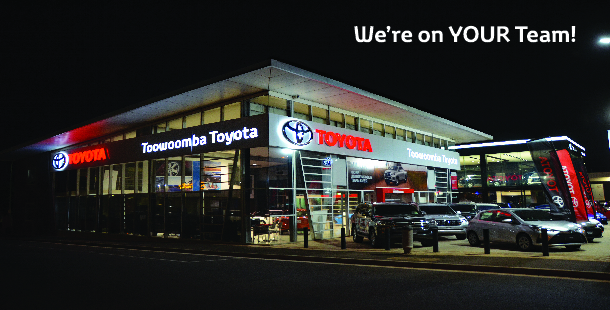 At Toowoomba Toyota we are pretty proud to be local and support the Community wherever we can! Whether that be by participating in Toyota's National Tree Day, or having our staff participate in local Community Events or the odd sponsorship or two! Below is some of the Organisations and People that we are proud to have on our TEAM! Toowoomba Toyota was very excited to sign off as the Exclusive Vehicle Sponsors of local not-for-profit organisation, YellowBridge QLD. YellowBridge Qld is a wonderful community organisation that supports more than 4000 people throughout the Darling Downs each year. The partnership means Toowoomba Toyota will sponsor two YellowBridge vehicles including a HiAce van with specially fitted wheelchair ramp and an Camry. The extra long wheelbase commuter van has generous interior space and will be used by the YellowBridge Disability Support Program to transport clients to social outings and appointments. The partnership went one step further with Toowoomba Toyota being the Foundation Partner of YellowBridge’s new social enterprise, Collectables, which was officially opened on 7 June and has already proven to be another successful program YellowBridge program. Collectables features a boutique op shop, men’s shed and group activity space to help people with a disability gain employment, access work opportunities and learn new skills. All staff at Toowoomba Toyota is proud to be involved in initiatives that benefit the local community. Supporting others is our way of showing our gratitude to the local community for their ongoing support of Toowoomba Toyota!